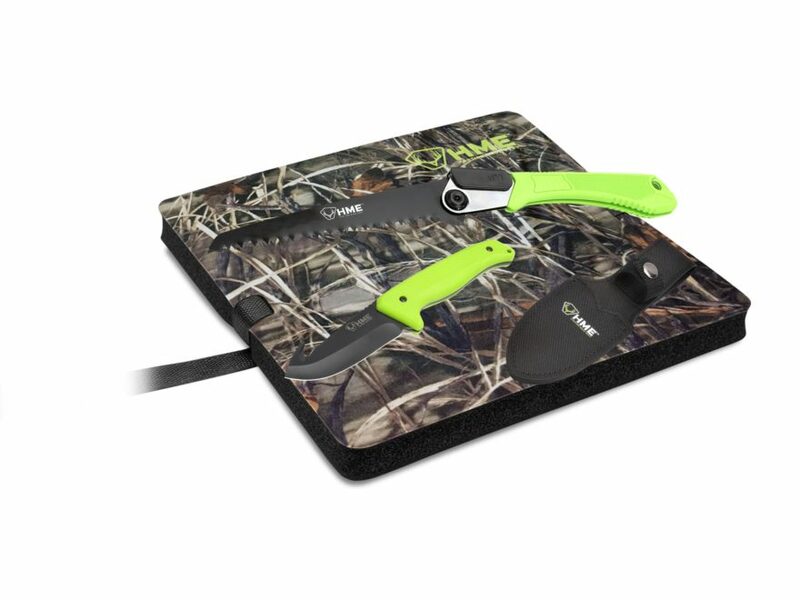 The HME Super Slam Turkey Combo gives you three tools that are very useful in a successful turkey hunt. The knife features a full tang blade constructed from 420HC Steel with a black oxide finish. The large drop point skinning knife features a gut hook with a thumb hole for absolute knife control. The integrated handle is a lime green TPR rubber handle slabs. The saw is a perfect sized for quickly sawing through tree limbs and saplings for blind making. The folding saw also features a black oxide finish and matching lime green TPR rubber handle slabs. Saw blade length is 8" and knife blade length is 9.5". The Super Slam Turkey Hunting Combo also includes a 1" thick camo foam seat. Designed for comfort this seat will keep you comfortable when your prized gobbler takes his time.